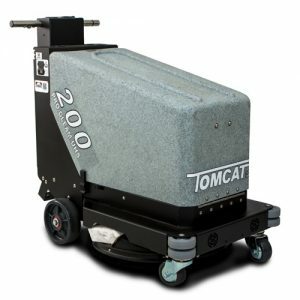 The Tomcat 200 Walk-Behind Floor Burnisher is the top-of-the-line battery operated floor burnisher that is extremely well built and easy to operate. Mopping is no longer required after buffing, thanks to the standard dust control. Easy maintenance and accessibility to small spaces makes every aspect of operation enjoyable. Seeing the results first hand is rewarding! The Tomcat Carbon Walk Behind Scrubber is well built and easy to operate. The powerful all gear transaxle comes standard, allowing for easy mobility up ramps and rough terrain. Aside from easy operation, steel guards and large polyurethane rollers help prevent damage to the deck and marking walls. Customers can choose between disk, cylindrical, and EDGE scrub heads to maximize performance for your particular environment. 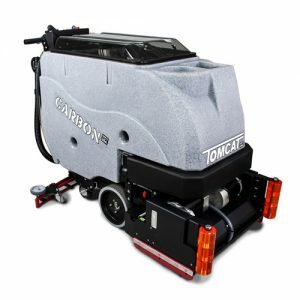 Tomcat GTX Floor Scrubber Dryer is the “best of both worlds” when it comes to floor cleaning. The sweeper-scrubber is clutch for those quick jobs without having to worry about under-performance. This compact machine has a 24″-34″ cleaning width that can reach up to 31,000 sq. ft/hr. Call today to schedule a FREE DEMONSTRATION! The Tomcat HERO Floor Scrubber Dryer is a well built, compact machine with the ability to clean floors at the highest level of satisfaction. The HERO is easy to operate and even easier to maintain. The construction of this machine is top of the line with two inches of steel frame for extra protection. 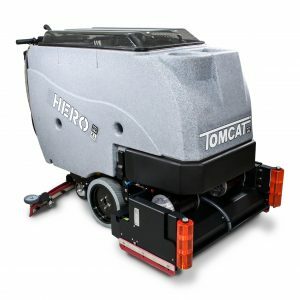 The cleaning width on the Tomcat HERO varies from 28” to 34”, depending on the customer’s personal and environmental needs. On a full charge, the HERO is capable of up to 5 hours of continuous cleaning to maximize productivity. 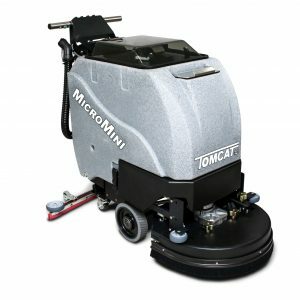 The Tomcat MICROMINI Walk-Behind Floor Scrubber Dryer is a walk behind machine that is available in disk or EDGE. The MICROMINI can either be driven by pad assist or by the powerful traction drive. The traction drive allows for easy maneuvering up inclines and over rough terrain. This machine is easy to operate and is built tough. The steel frame and polyurethane rollers keep this machine looking good, as well as the walls in your facility. Fit down small areas and conquer wide open floors with this unmatched machine. 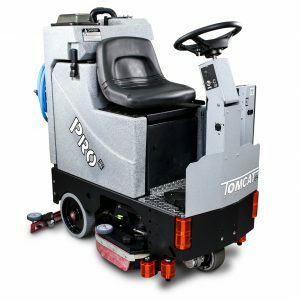 Tomcat PRO MicroRider Floor Scrubber Dryer is a compact machine that is easy to use and even easier to maintain. The construction of the MicroRider is extremely well built to protect the body of the machine. Enjoy up to 4 hours of uninterrupted cleaning on a full charge. Filling is made simple with the extended hose that can be used with any standard sink. The 23 gallon recovery tank helps prevent frequent emptying- allowing for increased productivity. 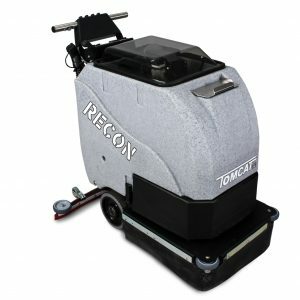 The Tomcat Recon Floor Scrubber Dryer is well built and easy to operate. The size of this disk machine makes it possible to reach close quarters in any environment while maintaining incredible cleaning action. The optional Clean Caddy expands the operator cleaning capabilities into something unmatched. Call today for a free demo. 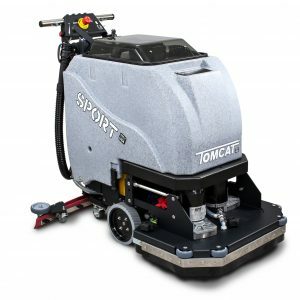 The Tomcat SPORT Walk-Behind Floor Scrubber Dryer is a compact and durable scrubber that performs at the highest level. The SPORT has a thick steel frame to protect itself in any environment and non-marking wheels to prevent any markings through the cleaning process. This machine is available in disk, cylindrical and edge. 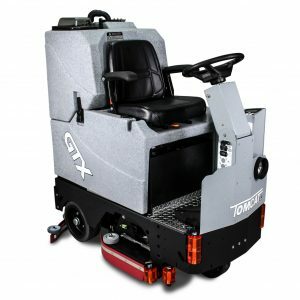 The Tomcat XR Floor Scrubber Dryer is the largest of Tomcat’s rider floor scrubbers. This machine is capable of a 46″ cleaning width and allows for up to 350 lbs of down pressure. Although the XR is a hefty machine, the capabilities in its maneuverability is not limited. With a 76″ U-turn radius, this machine can still fit down congested aisles or in tight areas. 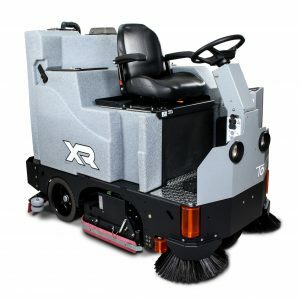 The Tomcat XR Riding Floor Scrubber and Sweeper is the largest of Tomcat’s rider floor scrubbers. This machine is capable of a 46″ cleaning width and allows for up to 350 lbs of down pressure. Although the XR is a hefty machine, the capabilities in its maneuverability is not limited. With a 76″ U-turn radius, this machine can still fit down congested aisles or in tight areas.